To get in touch with us, please visit us on Facebook at www.facebook.com/manchesterfinns and leave us a message! Or write a comment or question in the box below. First, there was Finn-Guild. You'll know by now that Finn-Guild in the U.K. has sadly had to decide to wind itself up, but you should really go to their site and read around. The website is still there, and it remains the most direct way of finding out about the full breadth of the presence of Finnish people in the U.K. Finn-Guild was based in London, but maintained links with all the Finnish Schools around the U.K., and naturally offers a wide range of language courses itself, which are continuing for the moment. 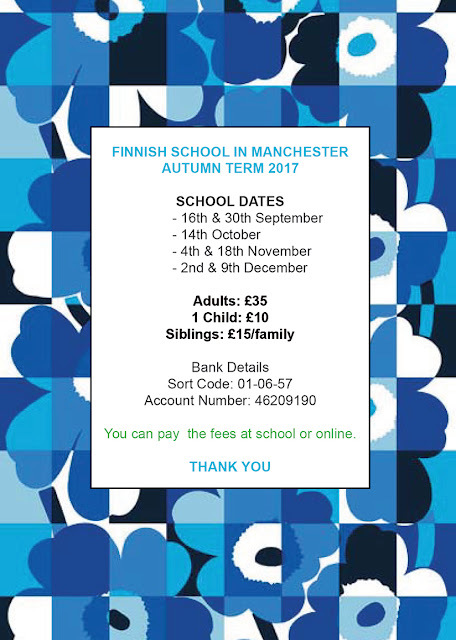 Here are some reasonably up-to-date links to the websites and Facebook pages of the various other Finnish Schools in the U.K. If some are missing, sorry about that! There is indeed quite a number of Finnish Schools in and around London, reflecting the predominance of Finns who have gravitated to the capital. The Rotherhithe School was the original Finnish School in the U.K.
All these schools maintain a Facebook page, and it's worth going there if you need a quick answer to a question. There are also contact addresses on Finn Guild's schools page for Finns in both Newcastle upon Tyne, and Frome (in Somerset), but it isn't obvious that either are formally set up as Saturday Schools. The truth is that suomikoulut have come and gone over the last forty or fifty years, but most major British cities seem to have a Finnish presence and a school organised. Every so often an enquiry pops up on Facebook, typically on a School's page a little distance away, asking if there are any other Finns interested in meeting or setting up a group. Even if you are happily settled in attending a particular school, it's always worth bookmarking the websites or Facebook pages of neighbouring schools. If only because, with the passing of Finn-Guild, Finns in the U.K. will need to work harder to keep up links between schools. Hello, I am looking for a Finnish interpreter (able to speak both fluent Finnish and English) in the Manchester / Old Trafford area to interpret at an appointment for a Finnish client. If anyone in your organisation can help, please call Anna on 07834 406184. Thank you! A couple of people showed interest, hopefully you've been contacted. Good luck! Hei, Suomen Lontoon-suurlähetystö järjestää Manchesterissä Presidentinvaalien ennakkoäänestyksen 20.1.2018 ja 3.2.2018 (mikäli kukaan ehdokkaista ei saa yli 50% äänistä ensimmäisellä kierroksella). Jos olet kiinnostunut toimimaan vaalivirkailijana niin olisitko yhteydessä Riitta.Kukkonen@formin.fi. I would like to join the Finnish beginner's class. How do I go about registering, please? I have seen the list of the 2018 dates. Thank you Mark. I'll be there. Really looking forward to it! I'd better repeat part of my vanished previous comment (I only wanted to correct a typo, but found that you can't edit comments on the blog, only obliterate them!)... For the benefit of anyone else interested in coming along to the School, 13 January would be a perfect time to start. Just arrive a little earlier, 9.45-ish, and have a word with either Kari (head teacher) or Pauliina, who takes the Beginner's Class. 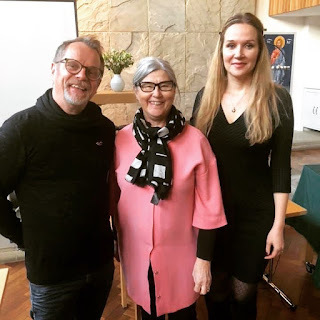 Satu Oldendorff, vice-chairman of the Finnish Expatriate Parliament, Cenral Europe Region was thanked for her long-term work. At the same time, Kari Henrik Tumelius, the head teacher of Manchester's Finnish school, was selected in London to continue as new vice-chairman. and Kati Hognes, the chairman of the area. Picture dictionaries! 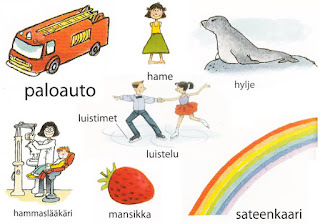 Although a dictionary is an essential purchase for a language learner, there's a lot to be said for getting a picture dictionary as well, so here are some thoughts about that, with special regard to what's available in Finnish. website and listen to the words spoken by a native speaker. There are quite a number of posts here, on a variety of topics. If you know what sort of subject you're looking for, such as food or language learning, click on Labels and then the subject label you want. You'll then see all the various posts connected with that topic.